Tell me the truth — do I really have to spend the rest of my life wrestling with ethnic identity issues? Can’t I just be me? What the hell does any of this mean anyway? Decade #2 (Ages 11-20): Wished I wasn’t living in Chinatown ghetto. Decade #3 (Ages 21-30): Loved having long hair & Chinese jewelry. Decade #4 (Ages 31-40): Blamed my parents for raising me wrong. Decade #5 (Ages 41-50): Coping with divorce; ethnicity irrelevant. Decade #6 (Ages 51-55): Should I paint pictures of sushi? Or apples? Thankfully, this next half a century of babbling on the shrink’s couch should be a little more interesting. After all, people of Asian heritage have reached a critical mass in the United States. Please, please, let us truly be at the tipping point, where re-invention is possible and life becomes new. As for what’s teetering on the brink of celebration…. The other night, my friend Jeannie Park talked me into going Jun Choi's fundraiser. The one-term mayor of Edison, N.J. has his eye on a House seat. If would make him the northeast's first Asian American congressman. The event was held at a super-swanky Manhattan address on Central Park West and had three fundraising essentials: Sen. Ben Bradley, who still has star power from his days playing for the New York Knicks; top quality booze; a team of doting, devoted Korean moms. 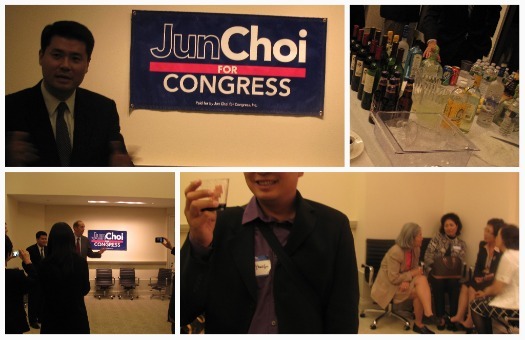 If you’re interested in knowing more about Jun Choi, check out his campaign here. I liked his message. He talked about what it was like to take on Edison’s police union, downsized his local government and helped reduce taxes. He ran for re-election but lost by a few hundred votes. Jeff Yang has been hired by the Wall Street Journal to write its first-ever column about Asian/American Pop/Culture. This son of Taiwanese immigrants lives in Park Slope, Brooklyn with his wife and their two sons. When he graduated from Harvard, the psych major went on to start an Asian American magazine. 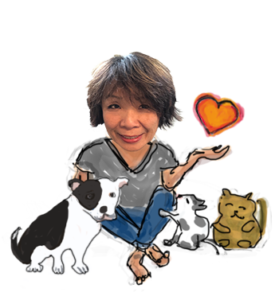 He has written books, many articles & passionately explores all things Asian American. Becoming a Journal columnist means Jeff gets a coveted, hand-drawn hedcut. These pictures are painstakingly drawn dot-by-dot and have become the paper’s artistic signature. Jeff named his column “Tao Jones.” It will appear every Friday on the Journal’s Speakeasy blog, which covers entertainment and the arts. I am so dense that he had to explain the column’s title to me. It’s a punny play on “Dow Jones,” the Journal’s parent company. Tao — which is pronounced “dow” — is the marvelous Chinese philosophy about finding “the way.” The column launches tomorrow. Let’s help our boy reach the tipping point by becoming his readers! This painting is in the hands of my first collector, Chuck Zoeller. He's head of special projects at The Associated Press and a former photo editor. He hung "cali roll" in his kitchen. He says that it "jumps off the wall and makes me happy every time I walk in the kitchen; even when the Yankees are losing." Last summer, I made a few paintings of Asian food. Looking at sushi and Chinese dumpling buns as art objects gave me a new way to access my culture issues. Painting forces me to stop thinking and just feel. I can honestly say that with the brush in hand, being Chinese and American wasn’t an emotional debate of “bad” or “good.” It became a matter of light and shadow, color and warmth. Now, if only I could stay in that head all the time. is a force that influnces, inspires but also distracts me in some ways. There’s a play I’ve been working on for some years that explores that. Maybe a timeline could be a great outline to chronicle my state of mind over the decades and organize my memories. I liked the tidbits you mentioned about these pioneering Asian-Americans. It is great seeing people step out and do challenging things. I think even though some of are not Asian, we can be proud of them as Americans, or identify with and support them just as people. The Tao Jones column sounds interesting. 0-10: Had no idea what Asian was about except that I was dragged to my mom’s friends houses in the Valley on random Saturdays, ate the watermelon seeds and had a lot of good Chinese food. 11-20: Realized that there are a lot of overachieving Asian kids in the OC and I was one of them. However, I hated the OC so I had to break out and go to school on the east coast and that is where I got acquainted with myself. Current: trying to get over being angry and raising my girls the best way possible. Interestingly, my team has called me “Empress” which could be construed as a backhanded compliment, but I don’t care. At least I get the work done! Now how is that for pioneering Asian? skye, would love to see what you come up with re your carib-american timeline. and jackie, it’s wonderful that you’re sorting thru all this stuff for yourself and your daughters. quite honestly, this post is about asian americans because that’s the hand i was dealt in entering this world. so that’s what i’m interested in tracking. but these are universal themes about identity, community and self-esteem — don’t you think? Hey, I didn’t know you had collectors! Can I be a collector? I love your paintings, particularly the food ones. I’m sorry to hear of your struggles, especially as a vibrant beautiful woman. I’m always so envious of asia women – lovely hair, petite and so smart! I don’t think you have anything to worry about! Hope your fall is starting wonderfully! What a great time of the year! The only struggle I have to deal with being around Asian-Americans are THEIR constant struggles with self-identity. Being American is nothing but trying to follow European culture. Americans try to rationalize that jeans, hamburgers, etc are “American”. NO! Jeans actually came from France, hamburgers from Germany. It is truly annoying how AA try to take advantage of two different cultures of Western and Asian, mostly to their benefits. I always ridicule them as twinkies because even if they claim they’re Asian, they don’t know much about Asian culture or follow their protocols. This is especially true of mixed children. They are not accepted by “white” society and forced to become a prototype of Asian-ness. Sadly, they crowned themselves as go to person without knowing much about their Asian half. What I don’t understand is why they seem to get upset when “Asian” society don’t accept them either. They DEMAND that they’re accepted, especially by their Asian parent, most likely being the wife. I actually had a verbal argument with one of these Asian wife who was married to an American GI, where I told her she can’t EXPECT Asians to accept their circumstances to her liking. She started to become extremely frustrated and started to yell and scream about how Asians are racists. Yet, whites who don’t accept aren’t?? I can go on and on about how these type of dysfunctional families are hypocritical and believe in self-entitlement, but for some reason, I always think of their types when I hear about Asian-Americans having identity issues. Just glad I didn’t have a Tiger Mom growing up. Sorry fem but I have to disagree with you on some of your points. The statement “being American is nothing but trying to follow European culture,” is a gross over generalization. There are values, viewpoints, and beliefs systems that are different between the two cultures. I believe that you are describing trends and inventions not experiences and groups of people. Also, there is more to being “American” than hamburgers and blue jeans. Just sayin’. Betty, I truly enjoyed your time line. I too wrestle with wanting to be accepted on my own terms versus being accepted by the “supposed terms.” I’m glad that you have found a way to embrace your heritage in a healthy, loving way. jennifer, i hope i will always be described as being petite, smart and beautiful — with lovely hair. haha! actually, you, fem and dlee are touching on various asian american identity hot buttons that i could talk about forever (but will spare you). what we look like and how we are viewed by society is so complicated for all of us. pick the race, ethnicity or gender and there are stereotypes. as we can see from fem’s viewpoint, how society views us is super-complicated because various segments of “our people” have their own opinions on whether we make the cut for being authentic. fem, i understand exactly what you’re saying because it’s what my parents believed until the day each of them they died. so that means that i have to disagree with you on every point! also — as the mother of a mixed race child, i need to say that if you can’t accept my child, how can you accept me? still, i really appreciate you taking the time to air your views so frankly here. you’re giving us a lot to talk about. always wonderful to have a discussion. Heading to San Francisco tonight. Are the asians there different than the New York ones? Will be having rhis discussion w/Judy. Penny, What are some of the values, viewpoints and belief systems that you’re referring to? I disagree that I’m making a gross over generalization. Generalization, maybe. We’re talking about millions of people here, so I have to generalize. There are two significant differences I I noticed about Europeans and Americans: socialism vs. capitalism; classy and cultured vs country hick and uncultured. Many people will agree with me on this. I noticed Americans try too hard to differentiate from Europeans, but America is too young to accomplish that. Betty, your comment about acceptance is throwing me off. I didn’t imply mixed children aren’t accepted as a person, but as of an Asian race. If you observe hapas, they act more “white” than Asian. Majority of them can’t even speak Asian language. They think just because they own a traditional Asian custom, they’re automatically Asian. Nowadays, with global power shifting back to Asia, and with popularity of Asian entertainers, they want that piece of the pie. When they face similar discrimination as here in the U.S., they automatically get angry and DEMAND their rights. This is a question I raise over and over again. Why aren’t they DEMANDING this so called rights in America? I’ve seen how they are treated here yet they seem like they accept the prejudice. I don’t see the Asian parent or their mixed children DEMANDING to be accepted by whites. Is this going back to Asians having chip on their shoulders when it comes to confronting whites? Possibly. fem, that’s the first thing i learned in therapy was the importance of speaking from personal experience. it makes for a much fuller exploration than talking about stuff on a “them” vs. “us” leve. so i would love to hear how you feel about your own identity. that’s the only way to have a real conversation. what’s your timeline look like? fem – You state and, I am paraphrasing, that the U.S. is too young to “culturally” differentiate itself from Europe. But where I am located, I feel that it is culturally different. It has been influenced by Western Europe -and by many other countries- but what country or continent has not been influenced by another nation? I have heard the argument of Europe being, as you said, “cultured, more sophisticated” and the U.S. being “country hick and uncultured.” Yet, I was taught the importance of being self-reliant, independent, and standing up for your beliefs. These are viewpoints, belief systems, and values that I have seen in the place that I was born and raised in and they were associated with American culture. As for “country hick and uncultured,” I have met too many people from too many places to know that it is not just Americans who act that way. However, I know everyone has different experiences. What were yours? 0-10: Was a weird kid, to be honest, :P but very happy and energetic. Loved playing video games with my brother. 11-15: Wish people would learn how to pronounce my name correctly, ugh. Realized that being “smart” was seen as being “white.” (what?) Also realized that being weird wasn’t cool and being “smart” will lead you to be unmercifully teased by people who what to use your smarts to get ahead. (How ironic.) Told I was smart, quiet, and shy a lot. Also realized that popularity isn’t everything especially if it means becoming someone you don’t recognize in the mirror. Found out my brother was going overseas because of the war and was too scared for words. 16-20: Hated that I nearly sold myself short when I was about to drop out of high school. Was able to leave a very toxic situation and gradually accept that my family wasn’t perfect but were supportive, in their own way. My mom’s advice about finding a boyfriend, “Find someone rich and good looking!” Realized that I wasn’t perfect and learned to love myself more. My brother came back from being overseas; was too happy for words. 21-25 (Present) Despite some up and downs with my health, I realized that I am intelligent, a music-lover, a dream chaser, and an impeccable decorator versus the expectation of who I’m “supposed” to be: quiet, a tool to be used and disrespected, and something to be molded and fixed into rather than be seen as a human being.